Torsdag 25 oktober deltok jeg, sammen med blandt annet representanter fra LO og Industri Energi på et polsk/ norsk seminar om omstilling i Krakow. 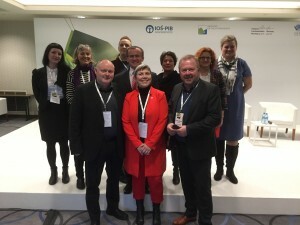 Seminaret ble arrangert av Klima og Miljøverndepartementene i de to land og var en del av oppkjøringen til FN toppmøtet om klima( COP 24) som arrangeres i Polen i desember. PÅ dette møtet blir oppfølging av Parisavtavtalen en hovedsak. Thank you for the invitation and the opportunity to address this seminar on such a important issue. I am the general secretary of the Electrician and IT Workers Union in Norway. Our union has 38 000 members, working in sectors like electrical engineering, production of renewable energy and distribution of electricity, telecommunications and IT. Our membership base is quite unique, as we have members both working in the renewable sector and in the oil and gas sector. Our union is politically independent, but we are active in the political sphere to set the agenda on behalf of our members and work towards political solutions we consider to the best both for our members, and the services they provide. Our policies are based on an economical and environmentally sustainable future and decent jobs for all workers. It acknowledges the common challenge in the change from a fossil-based economy, which posts a great threat to our planet and will adversely affect our livelihoods. The fundamental change we can foresee on our own societies are already manifesting themselves in other parts of the world. “Just Transition” has finally become an important principle when talking about the change from a fossil-based economic dependence to a low carbon economy. The Paris Agreement refers to just transition, a hard-fought victory for the international trade union movement and for workers all over the world. But what does it actually mean? And how do we get there? Jobs and employment must be priority number one when transitioning to a low-carbon society. But not jobs of any kind. When workers become obsolete, there must be an outlook for a new and better job. This is the most effective way of ensuring a work life that is constantly progressing and provides important social security. There must be policies for creating new jobs, through the mechanisms of the marked, but most importantly, through political will and action. Through sound investments in sectors which are sustainable and will provide many jobs to replace the former job markets, societies will be able to withstand mass unemployment and poverty. Secondly, it ensures that workers in challenged sectors will support the transition from an unsustainable economy through a knowledge that their future job will be a secure and decent job. There must be a prepared policy which will mobilise workers and gives them a belief in a sustainable future, also for themselves. Obsolete workers must not be left to precarious work and a fragile connection to work life. Temporary jobs and insecurity must not be the solution that they are offered. They cannot risk losing basic and hard-fought pension rights, getting a job which is more dangerous or a lower-paid job. Insecurity does not create flexibility. Security does. Therefor transition security is vital to get workers support and willingness in times of transition. Occupational skill is the most important asset in todays´s working life. The maintenance of skills and development of new skills is essential. There must be continuous work to maintain the competence needed, and this is certainly one of the most important principles of just transition. Both the work place and the education system must facilitate for workers to keep their skill sets up to date and to develop their skills further. Through this, workers acquire greater flexibility in finding a new job and resistance to unemployment. Further on, it gives societies the best foundation to grow and create sustainable economies. Both employers and the government must give the workers a real ability to develop their skills to meet the new future. In order to ensure a just transition to a low-carbon economy one is dependent on a welfare state which provides social security. There must be a political will for a changeover from status quo which develops a workforce to be dynamic and resilient. The transition might give periods where some workers are left without a job. The alternative to a temporary period of no employment cannot be poverty. In a state of transition, there must be a universal safety net through unemployment benefits that allows workers to find a new job in a sustainable sector without descending into poverty. In addition, there must be public policies that actively enables workers to increase and diversify their competence to become resilient to changes and increase their chances of getting a job in different sectors. The welfare state and government policies must facilitate this through a broad range of mechanisms. Amongst these is a financial commitment. The climate crisis is unquestionable and a challenge we must act on now. Unlike local pollution, this is something that cannot be solved without all countries changing their fossil-based economy. This requires an international and collective responsibility and a dispersion of the burden in transforming the economy and energy consumption. The rich and developed countries, like European countries, must take most of the burden in this transition. This means that countries like Norway, a gigantic oil- and gas exporting country, and other countries heavily dependent on fossil fuel, must act now to make a transition. We must use our resources and abilities, not only to allow for our own transition, but also for other, less developed countries to take advantage of the development in renewable energy technology and sustainable solutions. No action means putting both our own societies and others at great risk. As for all changes affecting workers, the cooperation between worker´s organizations, employer organizations and the government is essential. A just transition for a sustainable economy will require no less. According to the UNs International Labour Organisation, a “strong social consensus on the goal and pathways to sustainability is fundamental”. Social dialogue is an important instrument in this. Moreover, ILO underlines the importance of the right to organize and collective bargaining as a part of a just transition framework. This is the best way to ensure the worker´s voice and participation in the coming changeover. Moreover, the inclusion of workers in creating policies for the future is an important instrument in avoiding social unrest and a greater division in our societies. A transition based on these pillars will have a good chance to gain support and be successful in changing the society in a renewable and sustainable direction. Thank you for your attention and all the best for the upcoming COP24 in Katowice.